Jim shared his Tide washing machine cleaner review. My washing machine was filthy. It was completely disgusting and unfit to wash clothes. I dreaded opening the lid because it emitted a gross moldy smell. It got so bad my girlfriend even complained and refused to do laundry at my house. Tide washer cleaner completely removed all the grime and as a result I did not get blasted in the face with a foul stench whenever I wanted to wash clothes. Now my girlfriend stays over a lot more often. The instructions are easy to follow and the process does not take long at all. Furthermore I could not believe that such an effective product did not cost more. You do not have to throw out your old washing machine. I would recommend this product to anyone with a dirty washing machine. It will do the job and do it right without burning a hole in your wallet. Now I clean my washing machine at least once a month. What's the point of trying to clean clothes in a dirty washer? Thanks Jim for sharing your review of Tide washing machine cleaner. Sometimes you don't really think about it, but you actually do need to clean your washing machine on a regular basis, like you are now doing, or otherwise it can get pretty gross. And you are right, why would you want to wash your clothes in a machine that is gross? Has anyone else used a cleaning product for their washing machine that they like? If so, you can share your review here. You can also share your tips for how to clean a washing machine here, or read other tips that have already been submitted. 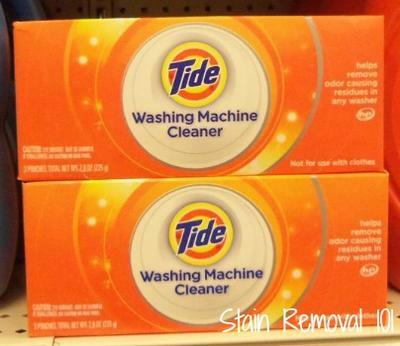 Carin also shared her Tide washer cleaner review. Before I used this product my washer would give off a foul odor when it was left open. I was honestly considering buying a new washer because of this problem, although that is obviously a very extreme and expensive solution. Fortunately, a friend of mine told me about Tide washing machine cleaner and I've been using it ever since. I now use it about once every month or two for my machine. I had previously tried using cleaning rags to clean the washer in order to get rid of the odor, but that didn't work very well. After I used this product just one time it removed the smells and now I can leave the door open without causing a stink in my laundry room. I no longer have that old water smell that many people like myself have to endure and now because of the success of removing the odor my laundry rooms smells great. I would recommend this item to anyone who suffers from the same problem I did. Thanks Carin for your review. Has anyone else suffered from a smelly washing machine? If so, please share your tips for removing odors here, either with a commercial product or a homemade remedy, or read other tips already submitted.